July 4th: What's On Today's Show : Blog Of The Nation Today's Independence Day Talk of the Nation: what the Constitution means in modern times, saying goodbye to the space shuttle, Jim Axelrod on his book, In The Long Run, and what motivates people to visit airport chapels. NASA space shuttle Atlantis sits on Launch Pad 39A at NASA Kennedy Space Center's June 16, 2011 in Cape Canaveral, Florida. In the fierce debates over healthcare, Libya, debt, gay marriage and other issues, Americans have been getting a lecture on the meaning of the Constitution and the intentions of its authors. Host Andrea Seabrook speaks with Richard Stengel of Time magazine and Yale Law Professor Akhil Amar about the political divide over the Constitution and how an 18th century document does and does not apply to a 21st century world. 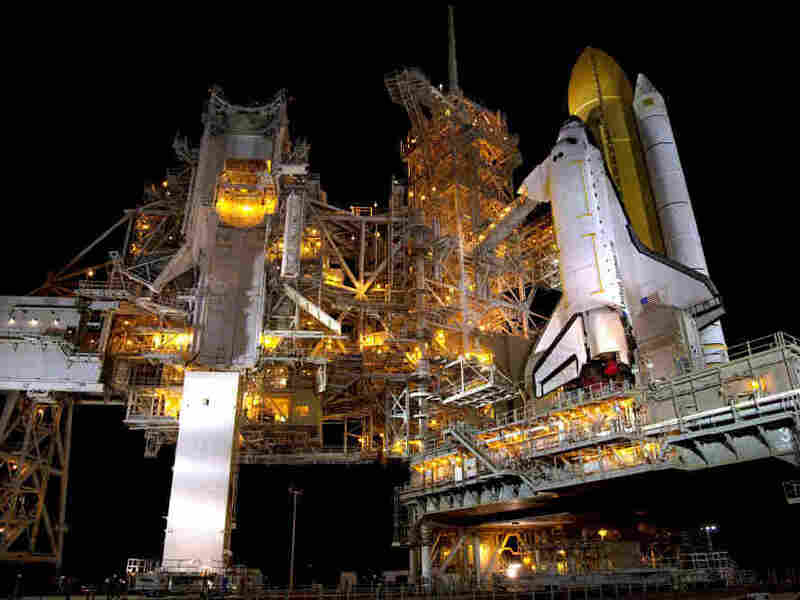 The space shuttle Atlantis stands on the launch pad, prepared for a scheduled final launch on Friday that will mark the end of the 30 year space shuttle program. NASA plans to shift its focus from lower-orbit vehicles to deeper space probes. While some argue that the new focus will allow radically new space technologies to emerge, others warn that America will lose the best and brightest minds in the field and its leadership position in space exploration. Guest host Andrea Seabrook reads from a selection of editorials and op-eds and talks with callers about the end of human spaceflight. At age forty-five, while covering the 2008 Democratic primary campaign for CBS News, Jim Axelrod realized he was miserable. He was thirty pounds overweight, drinking too much, sleeping too little, rarely seeing his family and worrying about his future as a television correspondent. Redemption came in the form of an e-mail, with a challenge from his father who'd been dead for eight years. In a new book, Axelrod chronicles his effort to regain control of his life by besting his father's New York Marathon race times. Guest host Andrea Seabrook talks with Axelrod about his new book, "In the Long Run: A Father, a Son, and Unintentional Lessons in Happiness." The first airport chapel opened sixty years ago in Boston. Today, there are hundreds in airports around the world any they continue to attract fliers for any number of reasons — some are nervous about air travel, some face personal crises or loss and some just need a place to pray. Guest host Andrea Seabrook talks with Scott McCartney, who writes the Wall Street Journal's The Middle Seat column and blog, about his article, "Flying on a Wing and a Prayer," and what brings so many people into airport chapels.